Summary: Arima Kosei was a child prodigy behind the piano, dominating the competition and quickly gaining fame. He was instructed by his mother, a famous concert pianist. Unfortunately, his mother passed away while he was still a child, and he had a mental breakdown while performing at a recital that resulted in him no longer being able to hear the sound of his piano even though his hearing was still intact. Two years after his mother passed away, Kosei has not touched a piano and views the world in monotone, plain and without any flair or color. He was content living out his life with his friends Tsubaki and Watari until he met a girl changed everything. Miyazono Kaori is an eccentric violinist whose playing style reflects her personality. Kaori helps Kosei sit back down at the piano and return to the music world. Kosei shows him that music does not need to be structured and rigid, it should be fun and an expression of your feelings. 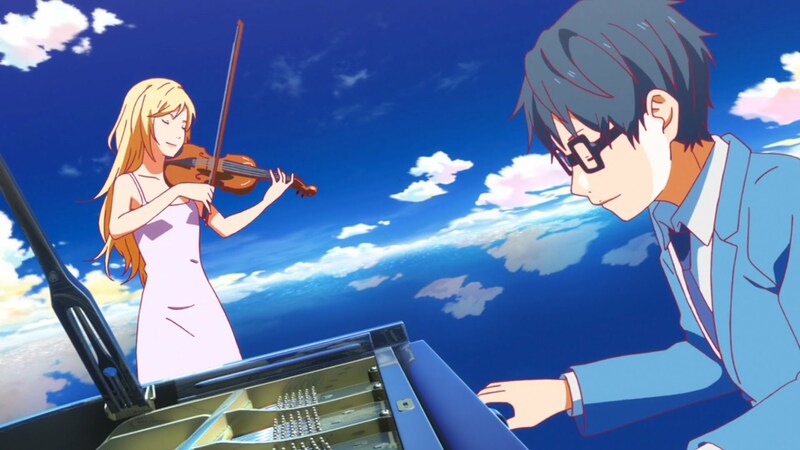 Your Lie in April is one of the best slice of life anime that has aired in quite some time. Staying true to classical music, it is a tragic love story that keeps you hooked from beginning to end. The music is beautiful. The creators of the anime did their research, with the music from the series being played on real instruments. It feels like you are in the audience at the concert performances. Not only do you hear the music being played, but you connect with the musicians when you hear their thoughts throughout the recitals. The characters are interesting. You will fall in love with Kosei and Kaori, as well as many others, like Kosei’s friends, teacher, and even his rivals. While this is a Music anime, there are times that it feels like a Sports anime, such as when the audience is explaining what is happening during the recital or when you begin to feel for the rival. You will not regret watching this series. You might enjoy this if: You are ready for tears. Happiness, sadness, the works. You might not like it if: If you have just gotten out of a long-term relationship and have not had time to recover. Also, if you are looking for a good laugh. Note to the Viewer: Your Lie in April can be a good introduction to classical music. This entry was posted in Anime and tagged 2014, anime, april, breanne, classical, drama, evans, fall, fragglepuss, kimi, lie, life, music, piano, review, romance, school, shigatsu, slice, uso, violin, wa, your. Bookmark the permalink.